Appropriate to ensure an effective grounding on painted sheets. Optimal conductivity and resistant riveting. 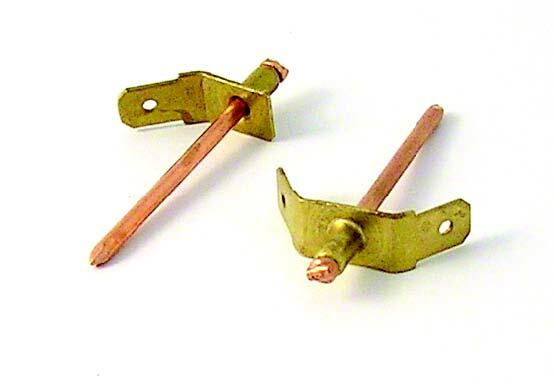 Bralo Mass rivets are mandrel-breaking blind rivets manufactured in different materials; the head is made of brass, the mandrel is made of coppered steel, while the mass is also made of brass. They have been conceived to effectively earth on painted sheets without damaging the finish. Bralo Mass rivets are provided with a serration that enters the lacquered surface, achieving an optimal conductivity and a solid and resistant fastening. Easy assembly in applications with a difficult access. Single-sided access (blind rivet). Outstanding conductivity. It does not deform surfaces once they have been fastened (painted, enamelled, etc.). Double tongue that permits one or two connections. Manufactured in 3.4 mm and 4.0 mm. diameters with a dome head. It is applied with simple, fast and lightweight tools.